Can we design robust monitoring systems that help prevent catastrophic failure in structural systems? Can we design smart structures that self-diagnose and detect hidden damage? Can we predict and control cumulative damage induced by operational demands on structures? These are some of the questions that inspire our research at the Structural Monitoring, Diagnostics and Prognostics Lab. We are particularly interested in discovering new ideas for solving large scale inverse problems under uncertainty and their application to the reliability analysis of operational and instrumented structural systems. 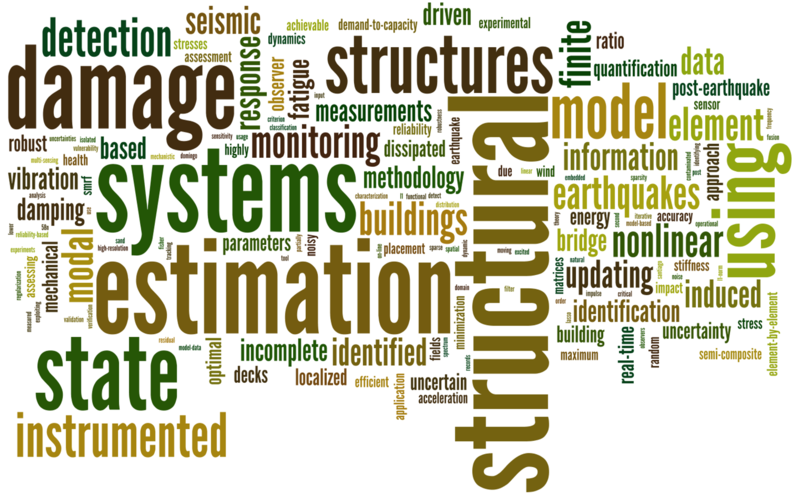 Areas of expertise include direct and inverse problems in structural dynamics, structural health monitoring, state estimation, reliability analysis and uncertainty quantification and propagation. Our research has been funded by the National Science Foundation and the Vermont Agency of Transportation. Below is a word-cloud of recent publications.